Halloween is a funny and a frightening time of year. It is one holiday where there is no need to obsess about entertainment options or gift-giving demands. We can choose to enjoy a good scare, or simply participate in the fun of trick-or-treating. If you are writing a movie script, you can learn a few lessons from the Halloween zeitgeist. Writing a screenplay does take a lot of work and dedication, but I always advise aspiring screenplay writers to have a little fun in the process. There are some scary issues, such as character development and dialogue writing, that can put your mettle to the test, but some solid scriptwriting techniques can put those problems to rest permanently. My book, The Story Solution: 23 Actions All Great Heroes Must Take, can equip any screenplay writer with the tools needed to bring depth and passion to even the most zombie-like of screenplays. The “23 Actions All Great Heroes Must Take” supplies an easy-to-understand paradigm that provides writers and filmmakers with the interconnecting, storytelling elements they need to create a powerful script. The “Halloween” Juggernaut: Since John Carpenter directed the original “Halloween: The Night He Came Home” back in 1978, this movie franchise has racked up incredible box office results worldwide. The plot was foreboding, and the visuals were viscerally thrilling. Audiences identified so much with the characters that this may have been the beginning of shouting at movie screens, “Don’t go into that room!” The principles established in Halloween helped set the standard for most modern-day horror films. The Exorcist: Before this movie came out in 1973, who knew that exorcisms could be so frightening? With a young girl inhabited by unspeakable demons and the heroic priests battling to cast them out, this has come to be regarded as one of the scariest movies of all time. William Peter Blatty won Oscars for Best Picture and Best Writing, Screenplay Based on Material from Another Medium. Exorcist barf bags anyone? Be mindful of including powerful adversaries. Sleepy Hollow: Turns out this little hamlet isn’t so sleepy after all. In 1999, director Tim Burton took a mildly amusing Washington Irving story about Ichabod Crane and a headless horseman, and turned it into ghoulish, intriguing fun. Don’t forget to look to the past for strong ideas that adapt well in the present. Psycho: Major kudos to Alfred Hitchcock and stars Anthony Perkins, Janet Leigh, and Vera Miles for breaking the rules of “proper” movie production back in 1960, but screenwriter Joseph Stefano carried the day with his well-crafted characterizations. Stefano won a screenwriter Edgar for Best Motion Picture and was nominated for Best Written American Drama by the Writers Guild of America. Another film with an exceedingly strong adversary with more than one dimension. Character matters, even in the bad guy. The Shining: In a possible morality tale for aspiring novelists about the stresses of writing, Jack Nicholson is seriously freaky as a crazed novelist. Stanley Kubrick manages to keep his 1980 thriller thoroughly unnerving by creating characters that are realistically frightening. Taken from author Stephen King’s novel, the screenplay was written by Kubrick and Diane Johnson. The lesson here is to maximize emotional impact by having a vulnerable looking hero up against an apparently unbeatable adversary. 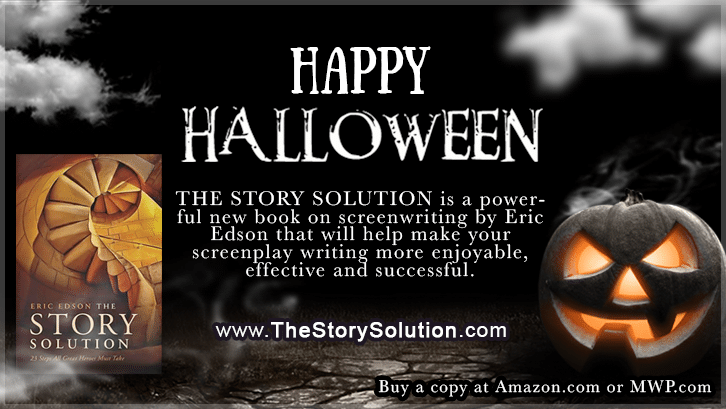 After having fun studying these Halloween movies, spend some time reading my book, The Story Solution. Recognized as one of the best books on screenwriting in the U.S., China and many other countries, it gives readers a solid foundation for their screenplay writing efforts. Q: What do you think is one of the most important skills to have when writing a screenplay? A: Although all skills are important, it is crucial that the screenplay writer know how to create dynamic characters that leap off the screen and resonate with the audience. My book outlines the 23 actions all great heroes must take. Q: How can I improve my dialogue skills? A: Read my book for dialogue tips, but also learn to be a careful observer of life. You want your dialogue to be human and realistic. Observe how people of different ages and backgrounds communicate verbally with each other. Writing dialogue for the printed page is not the same as writing dialogue for the screen. Q: What types of characters do I need to create for my movies? A: You are probably familiar with the most well-known characters such as the hero, the adversary, and the sidekick. Their dialogue has to be crisp and insightful. You also want to write meaningful dialogue for the love interest, mentor and endangered innocent. Listen to my audio clips to learn to create better characters when writing screenplays. Happy Halloween from The Story Solution! Hollywood has produced so many horrifying movies with great plot twists and nail-biting endings. These movies have made a lot of people both scared and impressed because of their great storytelling elements. Great screenplay writing basically reflects success in the box office and that includes the above-mentioned Halloween movies. The Exorcist and The Shining are two of my favorite movies of all time. It’s not just that they gave a great scare but they also had incredible screenplay writing. These perfect-for-Halloween movies not only brought a visual display of horror but also told great stories that kept audiences glued on their seats! It’s great that this post included these movies as perfect examples for aspiring screenplay writers. A scary movie contains a lot of key elements that go well together with the main story. Incredible screenplay writing is essential to keep audiences hanging on the edge of their seats. Effective scary movies make audiences think in spite of being shocked and scared at the same time. The movies mentioned above are great examples with commendable screenplay writing! I still remember the day that I first saw The Exorcist. The movie has been regarded as one of the best of all time. There’s no doubt that the scriptwriting of the movie and the flow of the story endeared moviegoers even if it’s as scary as hell. The other movies on the list are also terrifyingly good but in my honest opinion, The Exorcist tops all of them!